Sythetic Resin Tiles is the newest product that adopts both ASA high weather resistant engineering plastic of SABIC of the world’s TOP 500 Enterprise and the most advanced triple extrusion (A/B/C) technology for one-off processing, including the ASA layer (the surface layer ), the backbone layer (the middle layer ) and the adrasion resistance layer ( the bottome layer), Sythetic Resin Tiles are made of imported extra weather resistant engineering resin . It boasts extraordinary durability in natural environment. 2). Width: 720m/1050mm(Effective width: 640mm/960mm). 6). Length: customized but must be a multiple of wave pitch. 7). 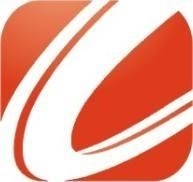 Color: dark red, brick red, gray, dark green, blue, orange, etc. 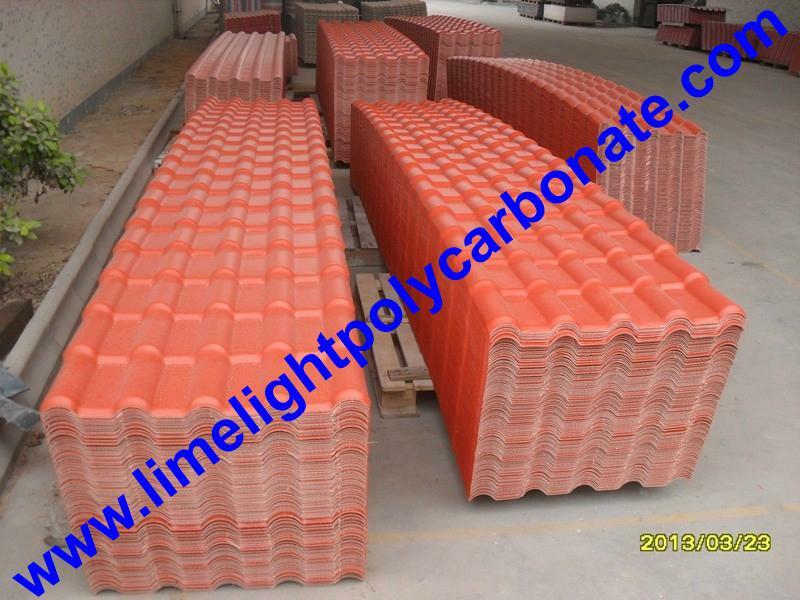 Accessories: Main ridge tile, diagonal ridge tile, three-way ridge tile, fittings, etc. 1). GELOY ASA provide the sheets excellent weather resistance and color stability, long life span up to 25-40 years and 10 years free from color fading. 2). Decorative ability, bring the roof fantastic wavy look and multi-dimensional effect. 3). Good load-carrying ability and anti-impact resistance, the test show no crack happened after 1 kg steel ball drop from 3 meters on sheet. 4). Excellent corrosion resistance, free from corrosion of varoius chemical substances such as acid, alkali and salt. 5). 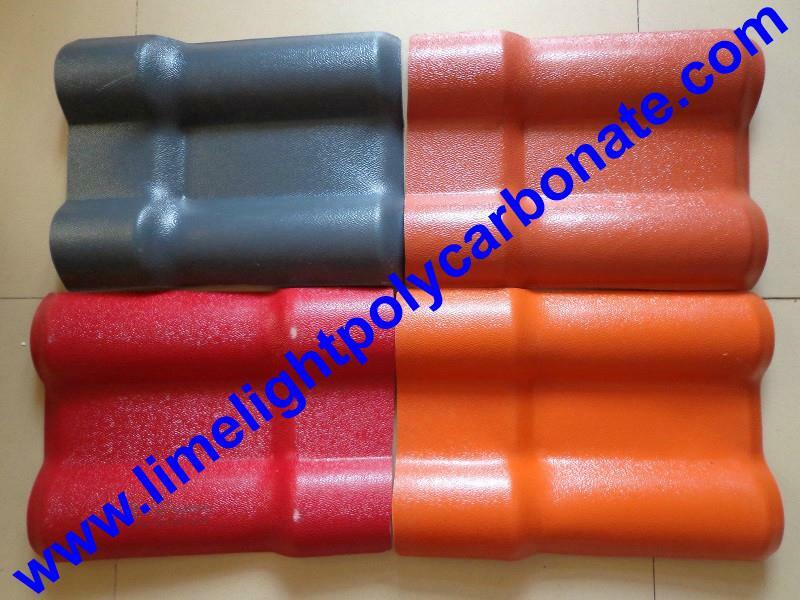 Heat insulation, the coefficient of heat conductivity is 0.325W/M.K, which is 1/310 of clay tile and 1/5 of cement tile, it can reduce cooling costs in your home or office. 6). Good fireproofing performance, according to GB8624-2006 fireproofing ≥class B. 7). Excellent waterproof performance, no water absorb and seep. 8). Green and environment friendly, don't contain asbestos and any redioactive element, can be recycled. 9). Easy to install, 960mm effective width and customized length ensure fast installation. 10). Self-cleaning performance, it don't absorb dust and very easy clean by rain. Flat to sloping roof conversion, residential homes roofings, villa roofing decoration, garden pavilion roofings, etc. 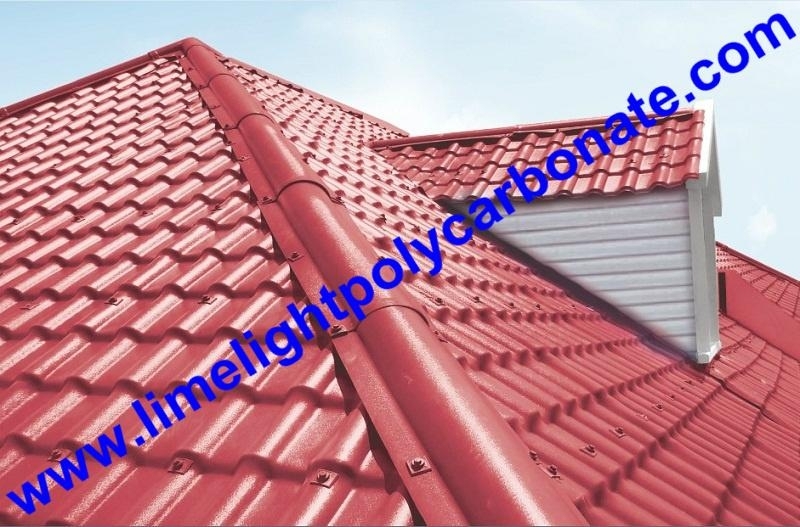 Synthetic Roofing Tiles, Synthetic Corrugated Sheets, Spanish Roofing Tiles PVC Roofing Sheet PVC Corrugated Sheet, PVC Roofing Panel, PVC Panels, etc. Payment Terms︰ T/T, L/C, Western Union, Moneygram, Cash, etc.